In an effort to dramatically fast track their growth, Nordic based debt collection/debt purchase company Axactor knew they needed a unique IT strategy. They weren’t simply looking for a mere IT outsourcing, they were looking for strategic IT partnership as a key enabler of the success and growth. In short, they were looking for something Miratech specializes in and that specialty is called Turn-Key IT. 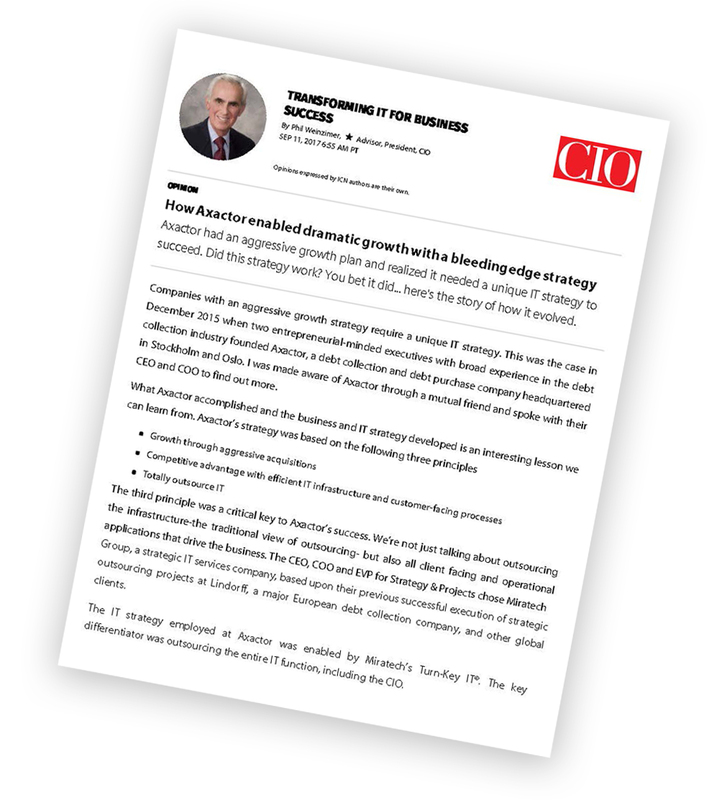 Check out world-renowned author Phil Weinzimer’s story in CIO Magazine of how through their strategic partnership with Miratech, Axactor was able to achieve outstanding results in just 18 months. Weinzimer has authored two books on the topic of IT strategy and is currently president of Strategere Consulting and works with his clients to develop business and IT strategies that focus on achieving business outcomes.